Awin is a native of West Africa. It grows wild in the forests of many countries of that region. A large tree upto 30 m high, with a densely leafy crown, but often shrubby; bole without buttresses, bark smooth, grey; slash reddish, yielding a little red gum. Leaves sometimes finely hairy, with a common stalk 5-13 cm long, with an odd terminal leaflet and usually 2 pairs of opposite or alternate leaflets, the lower pair being somewhat smaller; leaflets mostly 3.5-10 x 2.5-5 cm, elliptic to broadly elliptic, sometimes slightly obovate; blunt at the apex or abruptly and shortly acuminate, symmetrical and rounded or slightly cuneate at the base; leathery, glabrous above and with the midrib slightly sunken, sometimes finely hairy beneath. 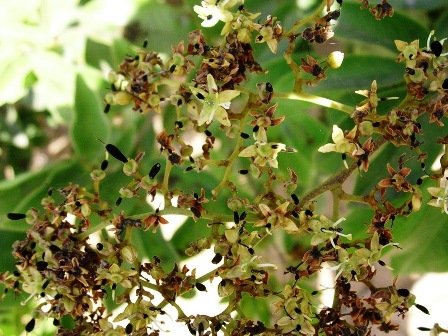 Flowers usually whitish, in large terminal, or occasionally axillary panicles up to 30 cm long; branches spreading out widely and more or less horizontally; the whole infloresence at first covered with very short, brownish hairs; individual flowers with short stout stalks, the buds about 2 mm long. 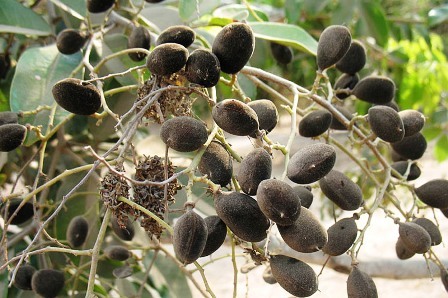 Fruits more or less circular and flattened, but sometimes almost globose, up to 2.5 cm in diameter, densely velvety, black; each fruit with a stalk about 6 mm long with a little collar near the apex, with a brittle shell enclosing 1 seed (or exceptionally 2), embedded in a dry, brownish, sweetly acidic, edible pulp. Awin pulp tastes sweet sour. It is peeled and eaten raw. It can, however, be a little constipating if eaten too much. A drink is prepared from the pulp by soaking it in water. This drink is quite thirst quenching and refreshing. Leaves, which are somewhat bitter, are cooked in Ghana to make a local dish called domoda. This dish tastes sweet and bitter. The wood is hard and is put to several uses including timber. 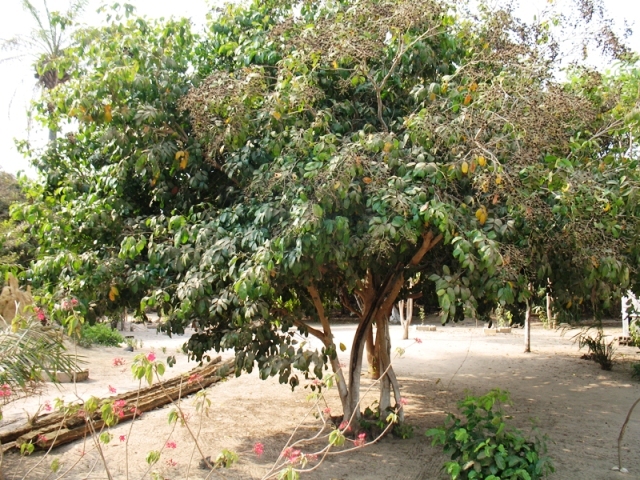 Bark and leaves of awin tree are used as medicine in West Africa for several diseases. Though awin fruits are widely consumed in West Africa, but still the tree is categorized as a timber tree. It is not planted for its fruits. New plants can be raised from seed which do not germinate easily. Mechanical scarification is recommended to promote germination. The seeds can be sown in beds containing a mixture of equal parts of forest topsoil and river sand. They are buried just below the soil surface and a layer of sawdust is spread on top. The beds should be shaded and regularly watered twice a day.